The art of writing sales letters (ad copy) is as dark as any old magic but it can be tought to anyone. At least up to a certain degree of skill. 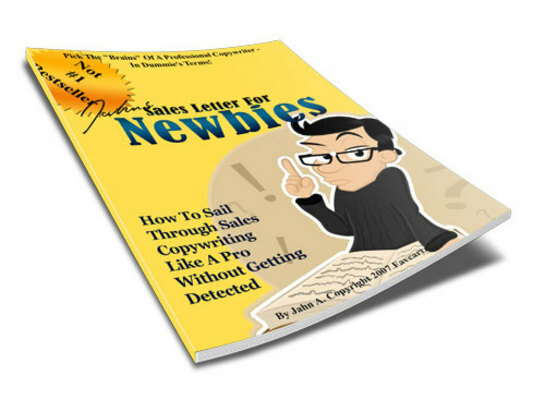 The sales letter for newbies book will guide any new and coming online marketer and affiliate marketer towards more profit and a better understanding of copy writing. How to format a sales letter like a champion. How to start and end a salesletter in a non boring way (keep them reading ). How to actually persuade Your customer to Buy from You and Close The Sale! You should get a copy of this low cost book and start re writing your low performing sales letters at once. Just think about it for a minute. By improving just one sales letter earning you $100 per month today you could jumpstart your income in days if not hours and make the $100 become $200, $300 or even more. Just imagine when you have reworked all your salesletters! Sales Letters For Newbies MRR internet marketing;marketing;writing 9150572 7.77 proekorn83 Fresh Download Available!